It was more than five years ago that I sat across from Mary at lunch. We had snuck out from the Food Nutrition Expo Conference to have lunch at Legal Seafood. Our view of Boston harbor on that warm October day seemed to frame our shared passion for helping making nutrition counseling kinder. We talked about many topics, but they kept returning to why explaining Health At Every Size, HAES was so challenging. Like many non-dieting professionals, no solutions were found at that meal, but the shared desire seemed to energize us personally and professionally. This experience continued to happen to me as I would meet another fantastic professional. Conversation after conversation would center about our mutual frustrating about how to make nutritional counseling compassionate, kind, and effective. Through all of these discussions, a nagging suspicion kept appearing in the back of my mind. The thought never fully formed until I listened to a lecture on weight-bias by Laura Thomas, Ph.D. Bias is an unconscious way of acting that influences situations and outcomes. Bias, when applied to weight, is called weight-bias and it describes how assumptions made about weight may affect the results. This understanding created a light-bulb moment for me, and that irritating thought became a clear question. What if my unconscious bias was creating a barrier for my clients? What if, experiencing my bias, which is weight-stigma, was the real reason my counseling wasn’t fully effective? I had always considered myself to be weight-neutral but exploring the topic of weight-bias and weight stigma more; I began to wonder was this assumption correct? It takes a lot of support to look objectively at your behavior. Sometimes this support comes as criticism which is often the hardest thing to hear. Taking a step back, you can see that no one is perfect and everyone makes mistakes. This means being wrong happens just like being right will. Backing up, even more, you may begin to question how you were taught about illness, disease, and nutrition. Was it free of opinion, did it include diversity or was it biased favoring the middle-class white perspective? You can ease the sting of feedback by realizing that your critics are speaking to you with the desire to help you change not to hurt you. No one changes fast, but some things can be done to accelerate change including having a clear path. A group of fabulous professionals drafted the weight-neutral self-assessment. One of the three goals of the weight-neutral self-assessment was to show how health care goals are on a spectrum beginning with weight-centered and ending with a weight-liberated perspective. These professionals who crafted the weigh-neutral self-assessment wanted to highlight that it is okay to have a mix of opinions regarding weight and in all honesty, it is rare that a person holds only one opinion about health, weight, and eating. 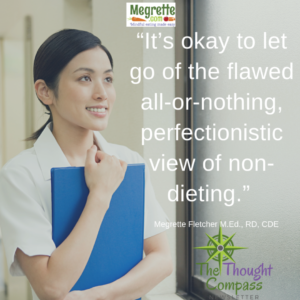 It’s okay to let go of this all-or-nothing view of weight-neutral care. This as a critical step in the non-dieting movement and why the self-assessment provides four broad categories to consider: weight-centered, weight-neutral, weight-inclusive, and weight-liberated. The first of the four categories is the weight-centered view. Typically this is what health professionals are taught, and it’s the most common view of health. This view asserts it’s a person’s weight is what determines health. This simplistic view of health provides an easy to understand the story, with a single villain – weight. As you grow into your profession, many realize that there is far more going on because there are so many questions that remain unanswered. The next category is the weight-neutral view which is neither weight-centered or weight-inclusive. It can feel a bit like no man’s land because it occupies the space of non-judgment regarding a client’s weight, size, or food choices. For example, there isn’t an endorsement for low fat “X” or regular fat “Y” but merely space for a client to reflect on what would be more appealing based on multiple variables ranging from taste to health outcomes. This space is more challenging unless you have had training in nonjudgemental counseling such as motivational interviewing. The third view is the weight-inclusive view which occupies a place of diversity by asking questions about the impact and ability for all humans to fit into a specific size. A weight-inclusive view advocates a nonjudgmental view of food, eating, and weight while promoting permission to be, to take up space, and to love yourself unconditionally, regardless of size. It is a powerful space, and it requires professional training in self-acceptance counseling, such as Acceptance and Commitment Therapy, ACT or Mindfulness training, such as Mindful or Intuitive Eating. The final category is the weight-liberated view which is the least common because it advocates for research to investigate health behaviors free of weight or health bias and stigma. It isn’t a small change due to the fact that every country has cultural and weight bias which is difficult to account for and harder to remove. Being weight liberated doesn’t include the social justice aspect of Health At Every Size. Healthcare professionals are encourage to take the personal journey to understanding size discrimination to fully understand how you will advocate for size acceptance. As a profession, we come in all sizes, and we will have different thoughts that won’t fall neatly into a single category. Being one vs. another isn’t the goal of any self-assessment. Ideally, this tool is to help you explore your thoughts about eight specific topics ranging from weight-loss research to weight-bias as it relates to health. As you examine your reasoning, you are better able to find assets to deepen your understanding of health outcomes, behavioral control, weight-cycling, weight-stigma, weight-bias, health-bias, long-term weight loss, and physical suffering.